Here at Streamside Fly Shop we offer a wide selection of fly tying materials and fly gear for your tying and fishing experience. We are ever growing and look to have the widest selection we can. If we don't have something you need we can get it. Please feel free to contact us on any special order. The best feathers for big streamers. 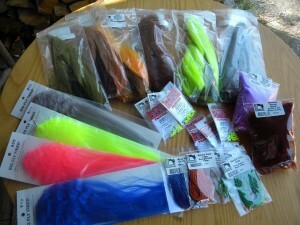 Great feathers for Large and articulated streamers. Great all around body wrap.